Right before this building we also visited the Ogden 19th Ward, which building is currently for sale, but I didn’t have a handout for that building. Ward Organized Oct 19, 1952. From 1953 to 1955 there were lots of dinners and activities held to help raise money for the building fund. Original building plans have a drawing date of 1959. In July-September 1963, work was done in the evenings and on Saturdays to prepare the grounds and chapel for dedication. Work accomplished included the painting of the Recreation hall, the addition of cloak racks in the lobby, the addition of cement walks, curbs and an outdoor patio. Dec 8, 1963 the Bishop announced to the Priesthood that Church authorities had given approval to proceed with installation of simulated brick on the outside of the meetinghouse. Vote by the Priesthood was unanimous assent. Feb 21, 1964 a Ward dinner was held in the Cultural hall to raise funds for the Chapel dedication. 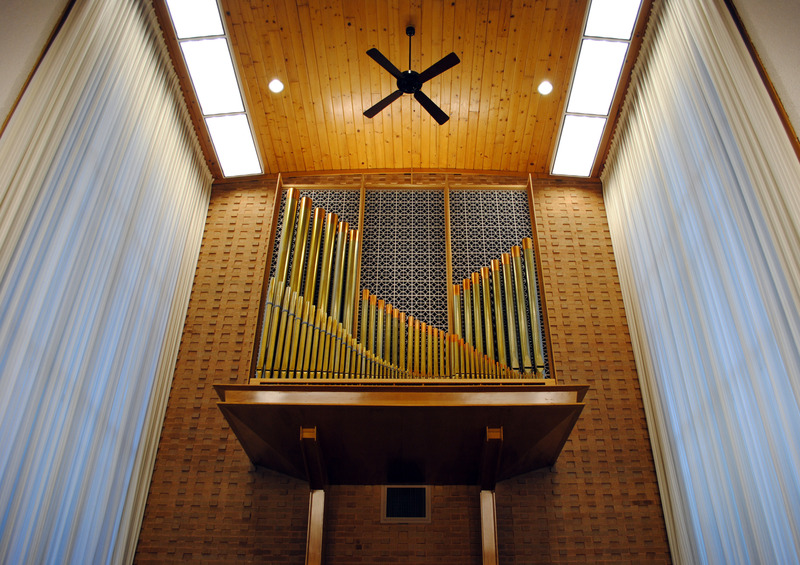 In July the Ward membership voted to get the chapel ready for dedication. Bishop presented the new Missionary Building program and the congregation sustained this method of completing the work necessary for dedication. 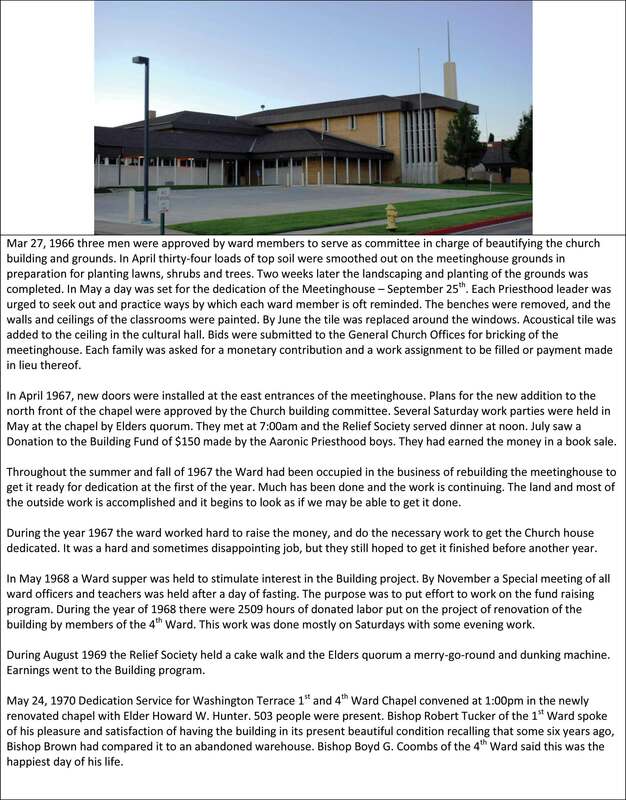 Mar 27, 1966 three men were approved by ward members to serve as committee in charge of beautifying the church building and grounds. In April thirty-four loads of top soil were smoothed out on the meetinghouse grounds in preparation for planting lawns, shrubs and trees. Two weeks later the landscaping and planting of the grounds was completed. In May a day was set for the dedication of the Meetinghouse – September 25th. Each Priesthood leader was urged to seek out and practice ways by which each ward member is oft reminded. The benches were removed, and the walls and ceilings of the classrooms were painted. By June the tile was replaced around the windows. 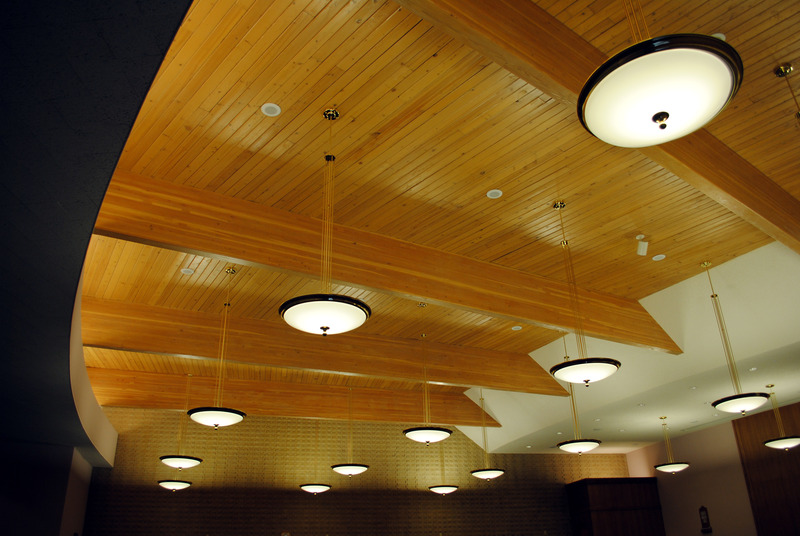 Acoustical tile was added to the ceiling in the cultural hall. Bids were submitted to the General Church Offices for bricking of the meetinghouse. Each family was asked for a monetary contribution and a work assignment to be filled or payment made in lieu thereof. 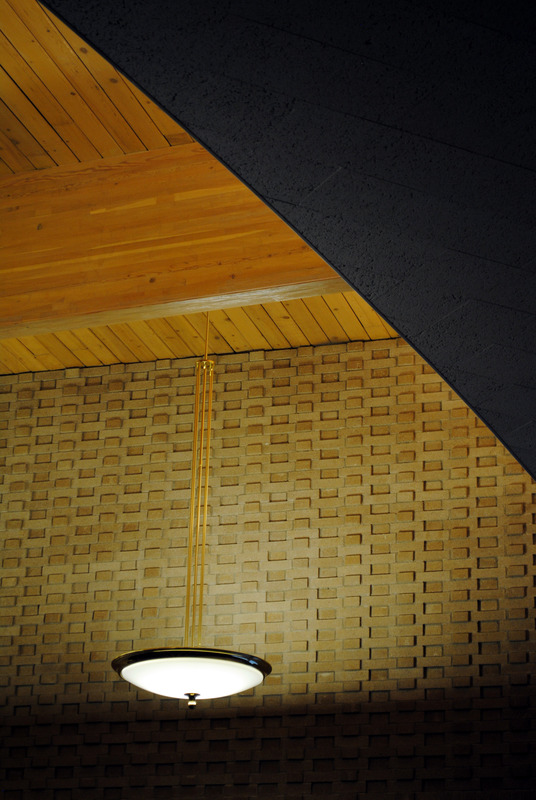 In April 1967, new doors were installed at the east entrances of the meetinghouse. Plans for the new addition to the north front of the chapel were approved by the Church building committee. Several Saturday work parties were held in May at the chapel by Elders quorum. They met at 7:00am and the Relief Society served dinner at noon. July saw a Donation to the Building Fund of $150 made by the Aaronic Priesthood boys. They had earned the money in a book sale. Throughout the summer and fall of 1967 the Ward had been occupied in the business of rebuilding the meetinghouse to get it ready for dedication at the first of the year. Much has been done and the work is continuing. The land and most of the outside work is accomplished and it begins to look as if we may be able to get it done. During the year 1967 the ward worked hard to raise the money, and do the necessary work to get the Church house dedicated. It was a hard and sometimes disappointing job, but they still hoped to get it finished before another year. 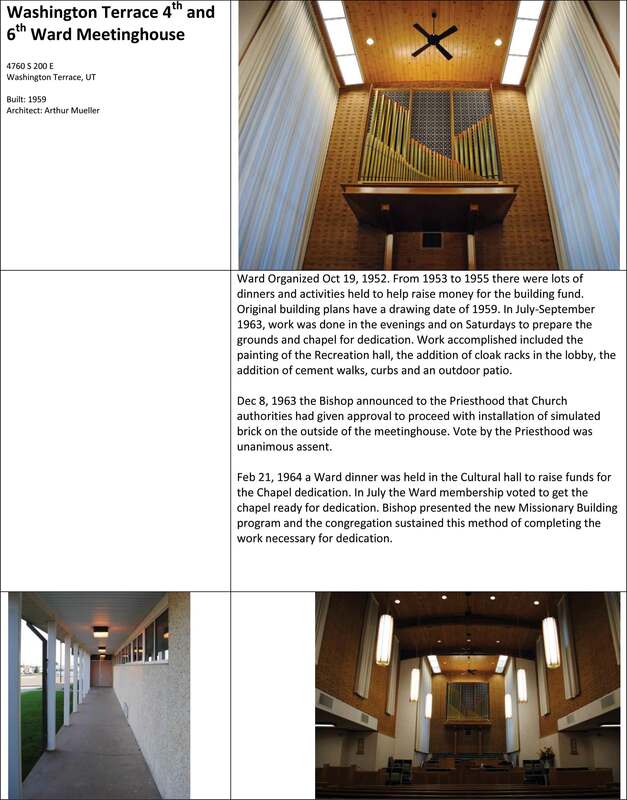 In May 1968 a Ward supper was held to stimulate interest in the Building project. By November a Special meeting of all ward officers and teachers was held after a day of fasting. The purpose was to put effort to work on the fund raising program. During the year of 1968 there were 2509 hours of donated labor put on the project of renovation of the building by members of the 4th Ward. This work was done mostly on Saturdays with some evening work. During August 1969 the Relief Society held a cake walk and the Elders quorum a merry-go-round and dunking machine. Earnings went to the Building program. May 24, 1970 Dedication Service for Washington Terrace 1st and 4th Ward Chapel convened at 1:00pm in the newly renovated chapel with Elder Howard W. Hunter. 503 people were present. Bishop Robert Tucker of the 1st Ward spoke of his pleasure and satisfaction of having the building in its present beautiful condition recalling that some six years ago, Bishop Brown had compared it to an abandoned warehouse. Bishop Boyd G. Coombs of the 4th Ward said this was the happiest day of his life.